Living with a CH kitty can sometimes mean incontinence issues, leaky diapers, and other messes. However, it doesn’t need to mean soiled carpets. Photo courtesy average_jane_crafter. 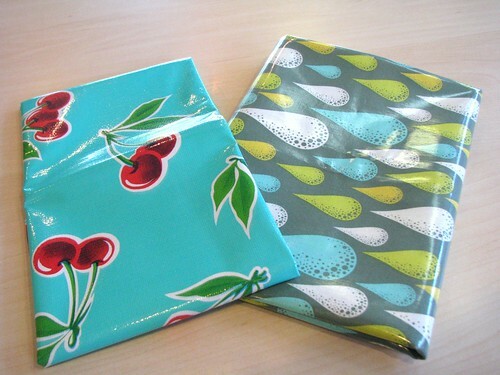 Oil cloth may be another good option to try. “I had some leftover upholstery material (approximately 3 x 3 yards), and some leftover table padding (can be purchased at a fabric store by the yard and the upholstery material in the remnant section). The material gives our kitten some traction, and she just loves to “ball” up the material. Plus if she pees on it, it can be washed fairly easily even though it is upholstery. The table pad can be place under the material with the felted side up and the plastic laminated side down – this helps hold the material and provides a barrier for the carpeting. Have you found ways to help maintain CH-related messes in your home? Please tell us about them in the comments! Use a portable flourescent task light (cheap enough) in the dark to find dry urine stains in the carpet then apply 50:50 water and white vinegar solution properly soaking the area. After 20 minutes or so dry this as well as possible with paper towels and then sprinkle baking soda on. Now mix a half cup of 3% hydrogen peroxide with a spoon of liquid dish detergent and apply working well in. Just leave this to dry and vacuum the dry baking powder residue and the result is unbeatable.